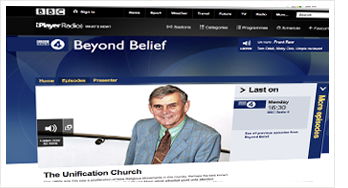 BBC Radio 4’s program “Beyond Belief” featured on January 7, 2013 a 30-minute discussion about the future of the Unification Church now that its founder and leader, the Rev. Sun Myung Moon, has passed away. Joining host Ernie Rae were Professor Eileen Barker, Director of Inform, an Information Network focusing on New Religious Movements, George Chryssides, Honorary Research Fellow in Contemporary Religion at the University of Birmingham and Jack Corley, Director of the United Kingdom branch of the Unification Church. The program can be accessed here. On the initial topic of Rev. Moon’s passing, Corley said that the church leader is “still very much alive” to many members around the world. Professor Barker pointed out that the church needs a membership to survive, and that its future will depend on second-generation Unificationists because the “rate of conversion isn’t very high at the moment.” Discussion about Rev. Moon’s charismatic character followed, drawing the observation from Barker that one does not need to see a person for that person to be charismatic, as many members who joined did not come in contact with Rev. Moon himself. On the following topic of brainwashing, Barker implied that if brainwashing techniques were used by the Unification Church, they were apparently inefficient due to the low retention rate of members. “I did a study of over a thousand people who were interested enough in the Unification Church to go to one of their workshop where these so-called techniques would be applied, but 90 percent of them said, ‘Thanks very much, we don’t want to be a Unificationist,’ and for the 10 percent who [stayed], the majority of them left of their own free will in a couple of years,” she said. Richard Barlow, who joined the Unification Church in the 1960s and was Blessed in Marriage by Rev. Moon in Korea in 1975, joined the conversation midway to share his experiences. He explained that he has distanced himself from the church because it “was not there to help” when his daughter fell ill and because of the rumors of scandals involving Rev. Moon and his children, which involved the possibility of “concubines and illegitimate children.” To him, the movement has become a personality cult and a monarchy, and cannot survive the death of its founder in this present form. Another topic addressed were allegations against Rev. Moon for having had sexual relationships with multiple women, to which Chryssides said that “It’s often characteristic of a religious leader that they can make the rules but at the same time be above the rules,” as well as the fact that the church owns a gun factory.